Sarah Smyth is a Canadian actress. 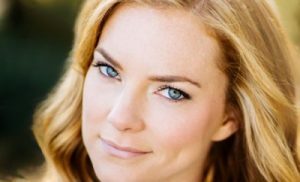 She is best known for her roles as Justine Lockhart in the Hallmark Channel family series Cedar Cove, and as Natalie Bouchard in the Showcase comedy series Naked Josh. Her other well-known television credits include Undressed, Durham County, and Call Me Fitz. Sarah’s film appearances include 50/50, Percy Jackson and the Olympians, Alien Trespass, and 12 Rounds 3: Lockdown. Born on October 12, 1982 in Nova Scotia, Canada, she began her acting career in 2002. *She was born on October 12, 1982 in Nova Scotia, Canada. *She started her acting career in 2002. *Her hobbies include reading, listening to records and spending time with good friends.